The perfect hot drink to stay cozy during a crisp fall night. I like the added zing of the ginger and lemon to the sweetness of the apple and honey. Use raw whole dried spices, not packaged or ground. Be sure to not boil, just heat up and serve. 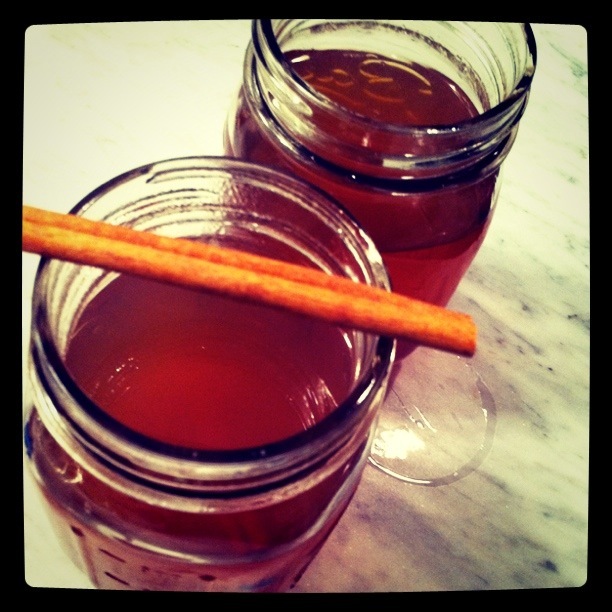 Combine the apple cider with the mulling spices and the ginger into a pot and bring to a simmer over medium-low heat. Drizzle some honey at the bottom of 4 mugs. Add the liquor, apple cider and squeeze of lemon. Stir to combine with a cinnamon stick. Winter Salad: Figs, Dates + Argan. The best fall drink of them all! Great photo.